Emoji for all your textual needs. In Apple’s Messages app, you can easily add emojis with a quick click on the little happy face icon in the iMessage text field. If you use a chat app like Slack, you can do the same. 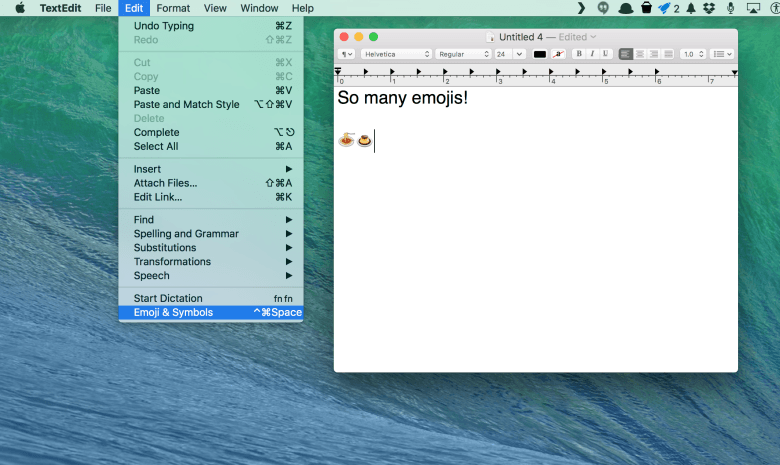 But what if you want to add an emoji to an email, a letter, or any other text field? Turns out there’s an often-overlooked menu item (with a corresponding keyboard shortcut) that lets you do just that. Find that overlooked menu item in the Edit menu. Open up TextEdit to try this out, but it’ll work in just about any app that lets you input text. Once you’ve clicked into the text editing area, click on the Edit menu, then travel way on down to the bottom item, “Emoji & Symbols.” Click on that and you’ll get a familiar emoji pop-up menu. Simply click on the emoji you want to insert into your text, and you’re good to go. Categories make it easier to find what you’re looking for. The emoji pop-up menu can be scrolled through with your trackpad, or you can click on the bottom tabs to go to specific categories, like flags or food & drink. You can also just hit the keyboard combination to get the emoji pop-up. 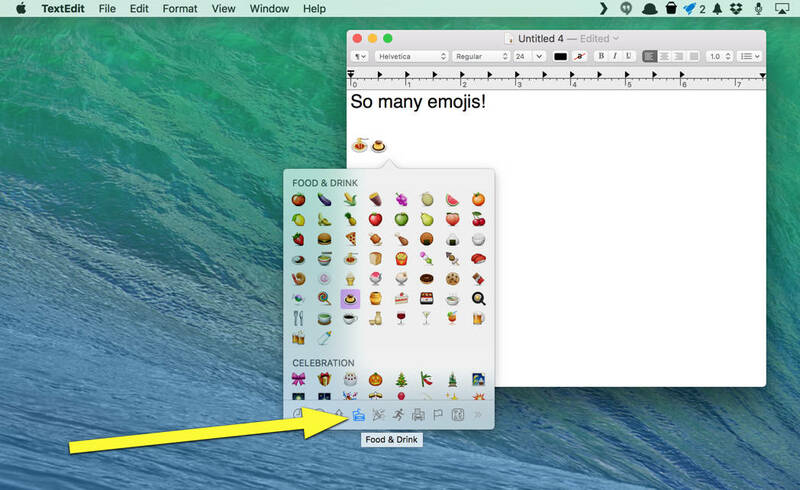 Simply press Control-Command-Space on your keyboard in any text entry area and the emojis will appear. Sadly, you can’t click more than one at a time, but you can copy and paste the characters as often as you like. 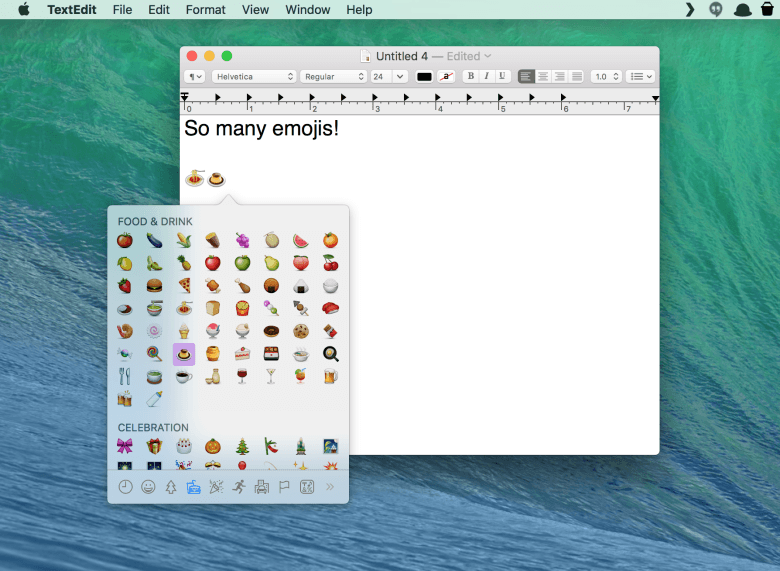 Now you’ll be wanting to pop a quick emoji in everything you write. Use this new power responsibly, though, because most bosses aren’t ready for your reports to be filled with kisses, love symbols, poop emoji, or spaghetti.